WASHINGTON—Saying she has grown increasingly concerned about her husband’s mental and physical well-being since last Friday, Christie Vilsack, the wife of Agriculture Secretary Tom Vilsack, told reporters Thursday that the despondent, butter-covered cabinet member has entered the sixth day of a destructive corn bender after being passed over for the Democratic vice presidential spot. 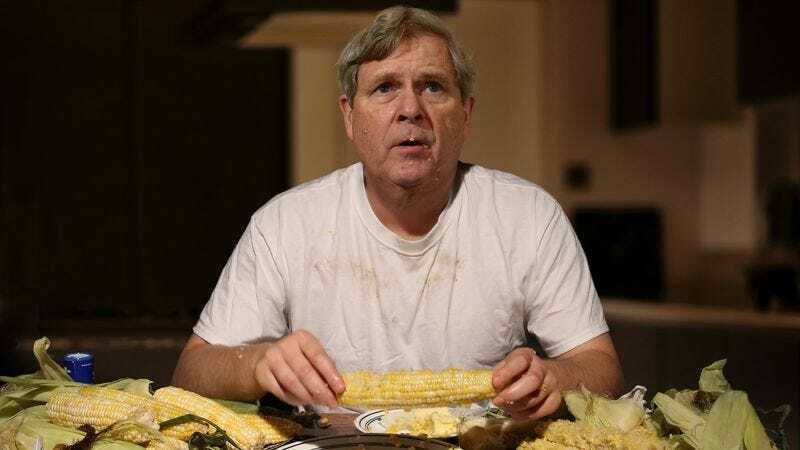 “As soon as he heard Tim Kaine had been chosen as Hillary’s VP, Tom immediately grabbed a big ear of corn, and then things spiraled out of control from there—he must have stayed up until four in the morning shucking, boiling, and eating God knows how many pieces of corn and not saying a single word to anyone,” said Vilsack of her husband, who over the past week had been seen wandering at all hours of the day through nearby farmers markets with yellow kernels and flecks of butter trapped in his unshaven stubble, barely lucid enough to tell the difference between flint corn and ornamental maize. “I don’t know what time he came home last night, but I found him this morning passed out at the kitchen table in a pile of husks and gnawed-on cobs. He says he’s just been working late, but you can smell the sweet corn on his breath. I’m really worried about him.” At press time, the disgruntled secretary of agriculture was spotted at a roadside farmstand in Maryland shouting incoherently at the vendor for cutting him off before he could buy an armful of Golden Cross Bantam.